If you're taking the idea of 'thinking big' literally and are looking to plan either an exhibition or conference for a large number of people, you might think that the number of venues available to you becomes extremely limited. However, this simply isn't the case - at ConferencesGroup, we've got a wide range of choices: here's ten of our favourites! The Westpoint arena can hold up to 7,500 people with 4,950 metres squared of column-free space; in addition to the 'Conference Room' with a maximum capacity of 500. With no 'fixed' points, the layout is completely flexible and can be changed to suit your needs. Located on the outskirts of Exeter, this venue can easily be reached by road, rail and air; and just twenty minutes from the beach means delegates can easily escape for the afternoon to get away from it all! With over 2,000 square metres of space, this venue is sure to be able to hold your event, whatever your needs! The maximum capacity is 2,800 delegates, with the ability to host dinner for 1,250 people. The main room - Centenary Pavilion - can be separated into two suites if more suitable; with 15 other suites and lounges available that can cater for smaller groups for a more intimate experience. A world-famous racetrack, this venue is home to 9 meeting rooms, able to hold up to 6,000 guests. Located in the East Midlands with direct access to the M1 and M42 means it's easily reachable by almost anywhere in the country. Different hospitality packages are available for companies including admission to the circuit, exclusive waitress service and all-day tea, coffee and biscuits. Having recently undergone a 5.5million pounds refurbishment, the Watford Colosseum has reopened as a major hospitality and entertainment venue, with easy access from London and the major airports. There are four meeting rooms on offer, in addition to the Forum and the Main Hall, which is equipped with a state-of-the-art sound and light system, plus facilities for video projection; catering to all of your conference and exhibition needs! An iconic building situated in Manchester's up-market Deansgate, its vaulted arches and station clock provide unrivalled character for corporate events. 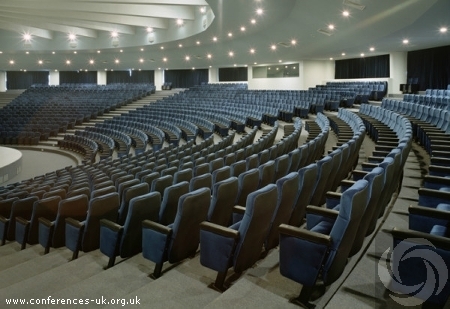 Facilities in this venue include an 804-seat auditorium, a 1,800 metres squared space for exhibitions and conferences, and a 10,000 metre squared column-free Central Hall, in addition to smaller, more intimate conference rooms. With over 2,500 hotel bedrooms a five minute walk away, this venue is extremely convenient. This venue is situated amongst beautiful surroundings, located on Southend's famous cliffs with views across the Thames Estuary. Having recently been refurbished, the modern Maritime and Admiral rooms, Pavillion restaurant and exclusive Lexus lounge offers something for everyone; whether it be a meeting for 10, dinner date for 600, or a conference for 1,630. Having been voted Best UK Hotel in the 'meetings' category by the readers of 'Meetings and Incentive Travel' magazine for the last four years in a row, this venue is extremely popular. The location couldn't be any better in trendy Lancaster Gate, overlooking picturesque Kensington Gardens, with the shops of Oxford Road a 5 minute tube ride away. The Lancaster London can hold events for up to 3,000 people; and its cuisine is renowned for outstanding excellence, ensuring your corporate event will be a huge success. This venue has played host to many memorable UK events, from the official opening of the Great Hall in 1909 by King Edward VII and Queen Alexandra, to the more recent BBC TV events including Question Time, and official Olympic gala dinner for the Jamaican Olympic team. Venue Birmingham offers a range of rooms to suit all needs, from Winterborne House situated in leafy surroundings, perfect for team away days and small meetings; to Bramall music building, with the Elgar concert hall boasting a maximum seating capacity of 420. This Grade A listed building, whilst historical offers contemporary surroundings inside, perfect for corporate events. With 8 spaces in total that can be used either separately or together, the Exchange is Edinburgh's biggest purpose-build banqueting space, with state-of-the-art LED lighting. Having hosted events from a roller disco to tenpin bowling, the Edinburgh Corn Exchange will be able to suit your every need. "Dream a theme and Chilford has the canvas to deliver" is this venue's motto, which is one of the largest exhibition, conference and banqueting centres in the East of England, with 2,600 metres squared of exhibition space. Located 20 minutes outside of Cambridge, the venue boasts 15 acres of outdoor space perfect for team building events, in addition to a helicopter landing area. Perhaps the most attractive feature of Chilford Hall is their award-winning vineyard, where delegates can enjoy a winery tour and taste!